Pasta bakes are the ultimate comfort food, this one uses leftover turkey, with bacon, sprouts and Stilton – prepare ahead and reheat in the oven before supper. Come the start of winter it is time to put away my spiralizer and embrace pasta again. Over the years I’ve learnt that with basic ingredients such as pasta you get what you pay for, and getting a better quality of pasta really does make a difference to the taste, and texture, of the final dish. Good pasta is made with durum wheat and will taste delicious with just a drizzle of oil or a pat of butter and some salt and pepper. Less really is more. Barilla have been making their pasta, which is sold in their iconic blue boxes, for over 100 years, and only uses two ingredients – durum wheat and water. 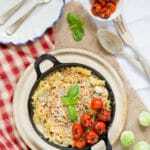 Fusilli is one of the most adaptable pasta shapes, perfect for all sorts of sauces. 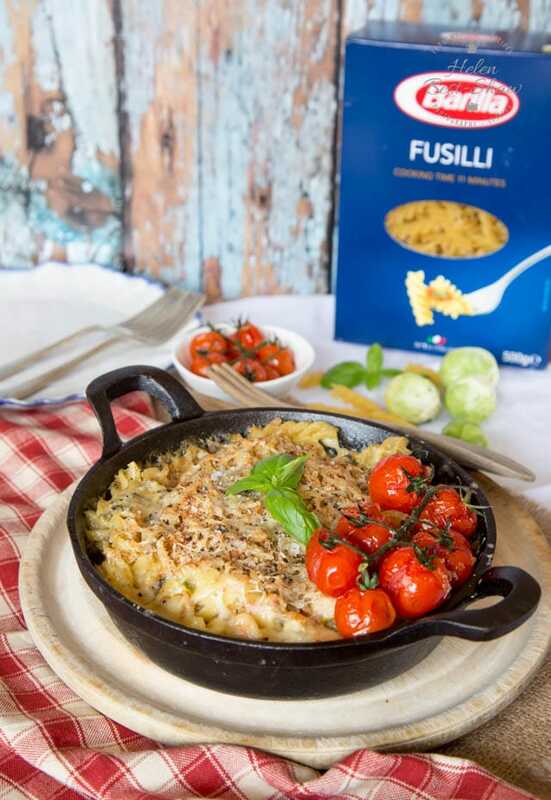 Fusilli comes from the south of Italy and gets it name from the “fuso”, or spindle used to roll wool. This pasta bake is ideal for using up leftover Turkey from Christmas or Thanksgiving, but of course you could also use leftover chicken, or ham. The recipe is adaptable, so use what you have to hand. What I love about a pasta bake is that you can prepare it in advance, make a huge one to feed a crowd, and even freeze before baking. It is the ultimate in lazy do it in advance food. 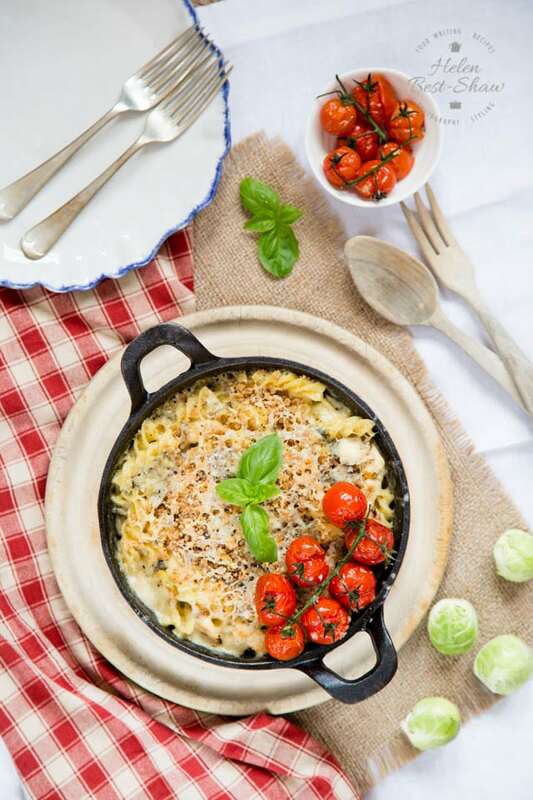 For more ideas with Christmas leftovers try my Stilton sauce for steak, or my turkey pasta bake with ham and mushrooms or my ham and pasta bake with an herb crust. If you try this Turkey, Sprout and Stilton Pasta Bake please tag #FussFreeFlavours on Instagram or Twitter. It is amazing for me when for me when you make one of my recipes and I really do love to see them. You can also share it on my Facebook page. Please pin this recipe to Pinterest too! Thanks for reading Fuss Free Flavours! Pasta bakes are the ultimate comfort food, this one uses leftover turkey, with bacon, sprouts and Stilton - prepare ahead and reheat in the oven before supper. Melt the butter in a small saucepan, stir in the flour and cook for a few minutes. Slowly add the stock stirring all the time, until you have a smooth sauce. Turn the heat right down and add the cream and Stilton, stir until the cheese has melted and season to taste. Fry the bacon in the oil for a few minutes, add the sprout and turkey and cook until they start to brown. Once the pasta is cooked, drain and add to the turkey mixture. Pour over the sauce and mix well. Transfer the pasta mixture into an oven proof dish, and top with the cheddar, extra Stilton and breadcrumbs. Bake in a hot oven for about 5 minutes until golden and bubbling.